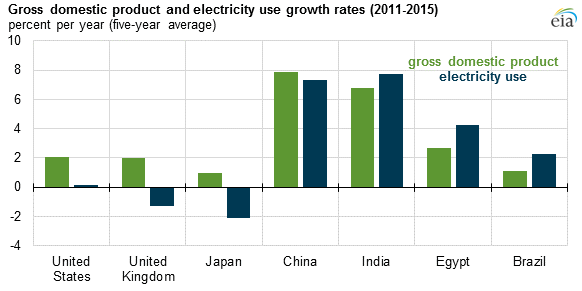 Growth in economic activity (measured as gross domestic product) has tended historically to be coupled with increases in electricity use as populations grow and generate more goods and services. However, more recently this relationship has been decoupling in many countries. The amount of decoupling in various countries is caused by many factors—including the countries’ relative level of development, electrification, economic makeup, and income levels. Most member countries of the more developed Organization for Economic Cooperation and Development (OECD), such as the United States, United Kingdom, and Japan, have been shifting from manufacturing economies toward service economies. Service-based economies tend to use less electricity than economies with high levels of industrial activity, as commercial services are generally less energy-intensive compared with manufacturing.